Condensed milk was always in our house hold growing up, my dad loves it and we would eat it straight from the can ! ( oops!) so I tend to have a can in my cupboard at home, as I use it in cheesecakes, slices or sweets. So when I spied a can , I instantly thought of caramel sauce . Caramel is one of my all time favourite flavours, if offered in sweets or desserts I will always choose the caramel. I wanted to make my own, but didn’t have the time to stand a watch a caramel sauce on the stove top, so I searched for the instructions on boiling condensed milk. It was so simple and I didn’t need to stand over it, so I gave it a try. Results first time! and it was super simple. 1 Bring a large deep pot of water to a gentle simmer over medium high heat. Remove the label from the can and place into the hot water, make sure the can is fully covered by water about 4 cm. 2 Reduce heat to medium -low, and let simmer for 3 hours. 3 Put a timer on for 1 hour and check the water to make sure the can is covered still. If not top up with water. Check every hour as you don’t want the water to go below the can. Remove with tongs and allow to cool completely on a wire rack. This should take a few hours. I left mine on the counter top and checked it the next day. Refrigerate after opening. Should keep for a few weeks covered in a container in the fridge. sizzle tip- use this a layer in a bonoffee pie, simple served over ice cream, in a chocolate slice, the list is endless, anywhere you would see caramel as an ingredient. DONT leave the can simmering unattended keep a careful watch at all times. Best to try this when you are home, and can monitor it safely. Yesterday was my 8 year olds twins birthday.. .. They requested chocolate cake, so I made two ! There was a party of 18 8 year olds and we played all the old fashioned games, pin the tail on the tiger ( cause they didn’t want a donkey ! ) musical chairs, musical statues, pass the parcel and Limbo !The girls did all the preparation with my parents, and my dad even drew the tiger, for pin the tail on the tiger. Mum made the bunting, and the chocolate crackles..
We had quite a bit of chocolate cake left, and since Australia day falls tomorrow, ( and lamingtons are ever poplar on this day ) I thought we could use up the chocolate cake and make lamington balls… success! They are great and so easy, just takes 20 minutes. Remember when you used to roll up the white bread and eat it? ( oh maybe that was just me),well the rolling of the chocolate cake reminded me of this. 1 In a medium bowl combine icing sugar with cocoa and butter. Stir in enough hot water till smooth. Break off 1-2 tablespoons of cake and roll into balls, about the size of a walnut. 2 Dip each ball into the chocolate icing, one at a time, letting the excess drain off on a fork. roll in coconut till covered. 3 Refrigerate or eat as it. Store any uneaten balls, in an air tight covered container in the fridge, for a couple of days. sizzle tip- use any left over cake- it helps if the cake is moist to be gin with, as it needs to be to roll, if you are having trouble rolling the cake, drip a couple of drops of hot water into cake and continue till the mixture comes together. I would have loved to have squeezed in some whipped cream and jam to make a true lamington style… I will have to get onto testing this. Cheesecake is one of my loves and this baked cheese cake is my all time favourite, its defiantly not one to have every day, but special occasions or entertaining calls for something as spectacular as this. Its got a slight tang from the sour cream, which only helps to cut through the beautifully creamy and velvety texture that is the middle of this cheesecake. Its best served at room temperature, and maybe a few berries in season to top it off. crumb, add butter and pulse till they come together. Press into prepared tin. whipped cream and drizzle with melted chocolate. 3 Line an oven tray with baking paper and lay pine nuts in a single layer. Heat sugar and ¼ cup water in a small saucepan over medium high heat for 10-12 minutes till bubbling. Reduce heat and simmer for a further 5 minutes or till golden in colour. Once the desired colour has been achieved removed from heat and gently and slowly pour over the pine nuts in an even fashion, covering all the nuts, allow to cool completely. 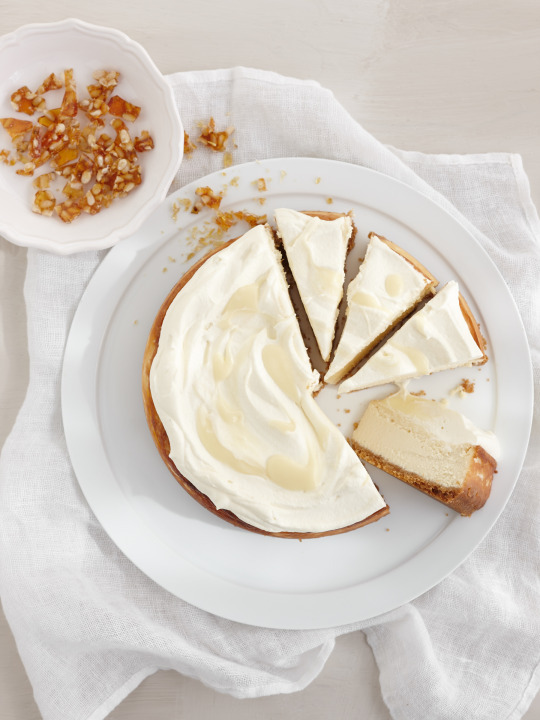 Crush the pine nut praline and sprinkle over the cheesecake. sizzle tip- If you don’t have a food processor, simply put the biscuits in a thick plastic bag and crush with a rolling pin.For the cream cheese mixture, beat with electric hand beaters, or a kitchen top mix master.